You know what they say about the path to perdition. Well, I'd planned all week for a montage of the sky and ridgeline that I see from my kitchen windows. I thought about it and I thought about it, but never touched the camera and when I went to take the pictures the sky chose to bury itself beneath a haze of milky white and nap like Sleeping Beauty. I made myself a drink - I swear it was not the one you see here - and while sipping my tea had another thought that did lead to the photograph and recipe featured today. A few years ago I was asked to make a punch for a shower that had an all blue theme. Drinks are not my area of expertise, but with a little research I was able to find something called Blue Lemonade Punch. Now, unbeknownst to me, there was one small problem with the drink. It's made with strawberry Kool-Aid. God has yet to create a man or woman who can taste blue curacao and vodka when mixed with this strawberry witches brew. Some of the revelers, though warned the punch was spiked, had a very, very good time that was matched only by the very, very bad headaches they had the following day. This is not that drink, but it's pretty darn close to it, so proceed with caution. I do love the color. It's perfect for Blue Monday. Combine all ingredients in a shaker jar. Mix well. Serve in tall, thin glass over ice. Yield: 1 serving. I'm sending this to Smiling Sally for her Blue Monday event. Oh, I cannot wait to try this drink. How amazing does this look! The blue color is just awesome. Deeelish. Elyse, isn't the color unbelievable? Everyone who enjoys an occasional cocktail should give it a try. It is a very pretty color and sounds so refreshing! I do believe I need a glass of that sparkling blue lemonade while I'm skywatching. :) Happy Blue Monday! Thanks for the compliments on my pictures. I loved taking them. I love that color as well but since I don't do liquour or liquers, any advise on substitutes? Mary, that is one beautiful drink! A frosted glassful of this is definitely in order. I can't get over that wonderful blue color. oh the drink looks gorgeous... its like a piece of art... really soothing looking... i think it will taste great too.. This reminds me of when we were young and made lemonade and mixed it with food dyes at a friends house. You can imagine what wild colors we used. It stained our teeth but we were having so much fun we didn't notice until her father, a dentist, came home and had a fit. This is a first for me! I've never heard of blue lemonade. Thank you for sharing. Happy Blue Monday! I don't consume alcohol much, but this looks too good to pass up. 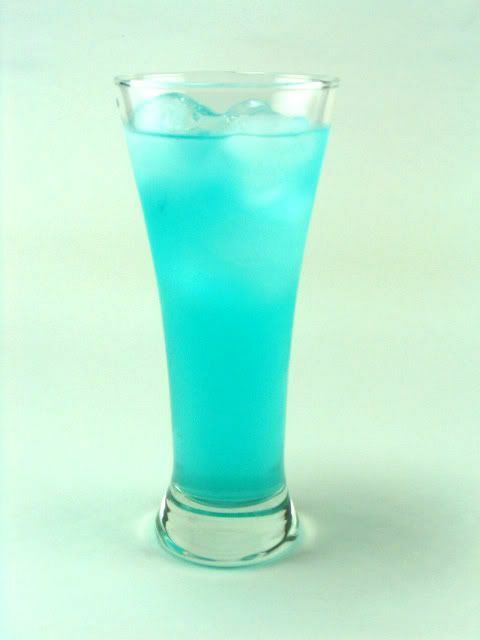 Chandy, I can offer no suggestions for a substitute if you want this shade of blue for your lemonade. However, you can get a blue lemonade by using pureed and strained blueberries. Also, a few drops of blue food color would do the trick. Yummy! I don't know if I have had this vodka. Maybe I have in a restaurant. Anyway, the color it beautiful! I've had a very similar drink at a party once, and don't remember much of the party! These suckers are dangerous! That looks yummy and pretty too! That's a pretty blue potent drink! It is definitely blue, and a pretty blue at that. I use to love my vodka mixed with Fresca. Tummy can't tolerate either one anymore. Guess that's what I get for being almost 70.
hahaha what an appropiate entry to this Blue Monday event!!! Looks lovely but with a punch! Just discovered you website. It's lovely. I love the bright color of the drink and oh btw your grandson Joshua is absolutely adorable. Jackie, welcome to my site. I'm so glad you found us. Joshua is a doll and we accept and solicit any and all compliments :-). I hope you'll visit often. Yummy falafel with a blue drink sounds like a FAB Monday! Marta, I'm glad you're starting to visit with us. I really do hope you'll come often. It's so pretty! I don't drink alcohol so I couldn't use this recipe but it does inspire me to try different colors of punch and lemonade to go with party themes! Your blueberry substitution sounds yummy! Thanks for stopping by today and Happy Blue Monday! That is a pretty lemonade..great for a blue them! Kathleen, welcome to One Perfect Bite. I hope you visit with us often. Hello, I'm still making my visits. What a beautiful post! Loved your blue lemonade, looks delish!